We serve to critique music, food, people, and pretty much everything else. Welcome to a justification of our own snobbery. Two artists from last decade you didn’t care about then (and surely don’t care about now) needed to get paid. Robyn returned from herBody Talk tour emotionally spent and artistically exhausted. She moved to Röyksopp’s hometown of Bergen, Norway, in the hope of finding some inspiration. Together the trio found it, through bonding, friendship and wild nights of partying. The end product, the five-track EP Do It Again, explores hedonism, love and artistic anxiety through the prism of festival-ready electro house. Is this part of the review or the press-release? The lead single and title track is a hit-you-over-the-head party anthem full of fluttering synths and slamming drums. It’s a pure pleasure overload with a heart-in-mouth breakdown for good measure. I’m 32 years old, that sounds terrible. Robyn’s lyrics are painfully simplistic, but hidden deep in clichés like “It hurts so good” and “Wait for the build-up” is a sort of existential ache. Look at it from one angle and it’s a humorously straightforward club banger, but inspect it more closely and it’s a comment on bad habits (“And when we come down / We just do it again”) or a metaphor for a flawed relationship. Again, I’m 32 years old, that sounds terrible. Moreover, you are telling me it’s terrible but because it’s a metaphor for something relatable I should allow it? I’ll pass. The track wouldn’t be much without Robyn’s powerful vocal performance, balancing wounded pride and nervous excitement to deliver these lyrics like no one else could. So you’re telling me the track is boring, and I’m willing to bet 99% of RA readers don’t care about Robyn, so, why is this review even here? Who paid for this review? 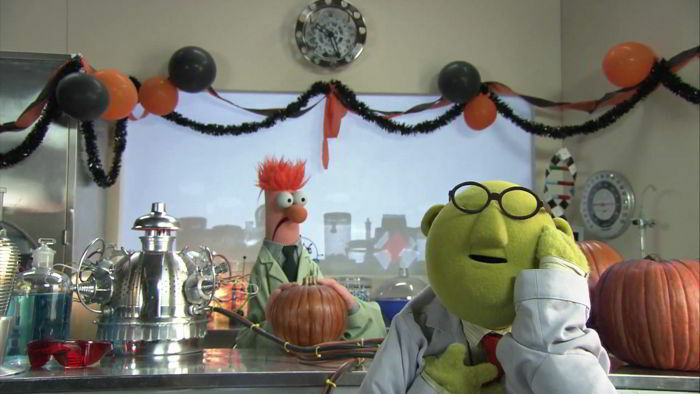 The rest of the EP veers between silly and serious. “Sayit” could be a holdover from 2009. So are your aspirations of becoming a successful journalist. You obviously don’t understand my tastes. “Every Little Thing” is a power ballad rendered in dramatic dubstep thrusts. I’m 32 years old, that sounds terrible…. I give up, I can’t continue. This is horrible, and not because the music isn’t compelling but the writing is about as hastily thrown together as what’s being reviewed. Resident Advisor, if this is not a sign that Andrew’s, and your best days are behind you I’m not sure what else you need. “Rules” quickly descends into a bubbling morass of acid-tinged synths, through which a wintry drone blasts. Bubbling? Again? This was addressed yesterday, pay attention RA. Arkist adopts a peppier approach, unfurling a yawning bassline and subtly brutal kicks. Awesome Alliteration! The only thing subtly brutal here is the idea that someone at Resident Advisor OK’d this review before they published it. Stephen Worthy‘s writing here is worthy of 1 star out of 5. Three short paragraphs that namedrop his parties, offer a brief sentence about each track and briefly mentioning that Arkist provided a remix. This “review” subjected readers to more bubbling and adding warming jets to the #50shadesofresidentadvisor list, but that’s no problem, Stephen assured us the Brevity is “gauzy” so it should be an easy cleanup. Two in one day? Why not. The fodder is there, and this time I’m going to step away from the “big 3” to show I’m an equal opportunity critic. My next exegesis / review of a review is Tiny Mix Tapes’ absolutely childish summary of Ekoplekz‘s latest full length on Planet Mu. Immediately comical in its shape and in its design, the record is full of damp-sounding instrumentation and dry knock-kneed drum patterns. What does this even mean? Is this record not a 12″ flattened disc? If so, what kind of turntable am I going to be conned into buying now? Nice contrast between wet and dry by the way, that’s the recipe for mud. Within “Scientist,” Dopplereffekt pairs the image of a scientist with classic sci-fi laboratory bleeps and bloops: incredulous machinery performing unknowable acts. Also, why am I now reading a review of a 15 year old Dopplereffekt release? Oh well, at least it wasn’t a Tangerine Dream or Burial allusion. Deforrest Brown Jr. showing readers here that he is enthusiastic to contribute to the sphere of blog influence but this review is not ready for primetime. 2/5 stars, I should give you 1 but I admire the effort. Starting a new series here on icnt.mx, an exegesis of online music reviews. We kick things off with a Resident Advisor review of the new Tobias Freund full length on Ostgut Ton. Definitely not the worst review from RA as of late, Appropriately titled A Series Of Shocks, it seems like the artist was already prepared for the slew of adjectives ready to be lobbed over the fence by myriad bloggers. 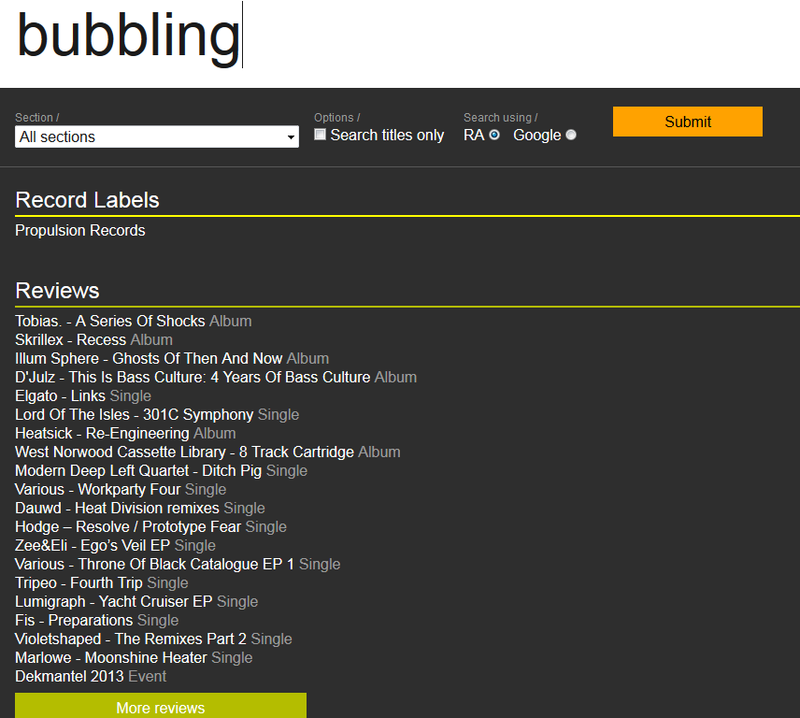 Here’s what happens when you search “bubbling” on RA. Tobias, Skrillex, Dauwd, and that’s just the top page. Toil and trouble indeed. 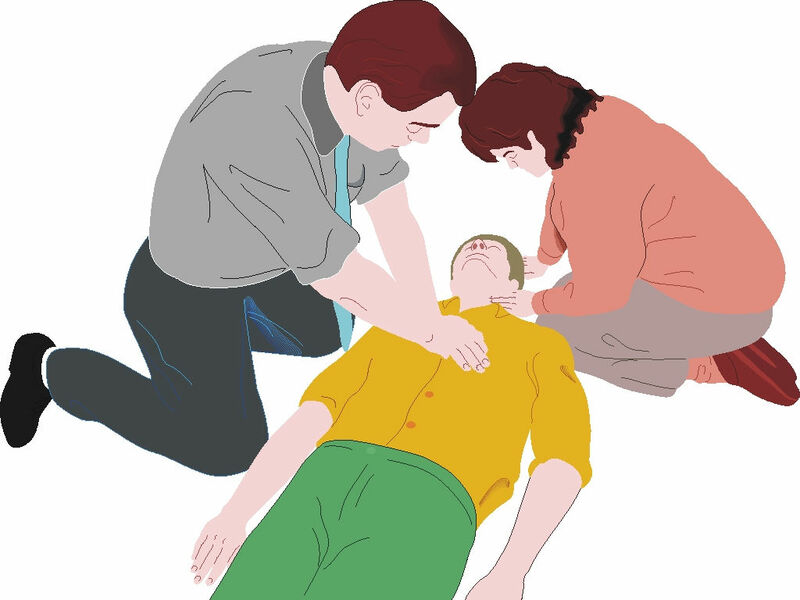 …compresses your chest with physical force. Overall, a solid effort from Resident Advisor – Tony Naylor picked up the slack nicely on this one. Bubbling, compression, and Tangerine Dream references are a bit overdone lately, but definitely a review work checking out, a solid 3/5 – 2 points docked for reminding us he worked with Milli Vanilli, 3 points for going the entire review without a Freund / Freud joke. If I compare LHF to Downliners Sekt it’s that both represent a collaborative of musicians tastefully able to downplay their personal roles without resorting to masks or unpronounceable and otherwise unidentifiable monikers. More importantly, both maintain cohesion and an obvious attention to detail in their infrequent but typically exceptional releases. We are obsessive people to say the least, and obsession is not easily shared – nor is it often appreciated. Creating music has always been vital for us. We craft, arrange and sculpt it endlessly until we’re satisfied. Expectations are always high, and the most challenging part is to keep it alive and genuine all the way. The latest from Downliners Sekt, titled Silent Ascent is their third full-length release and easily stands up to all the high expectations many have come set for the Barcelona-based duo. Trusting nobody came to read hastily thrown together adjectives relating my personal listening experience, it’s fair to at least point out across the hour long 12 track release, I did not fast forward any parts and never experienced ‘album burnout‘ typical of recent electronic-centric full lengths. Silent Ascent is due out April 7 on InFiné, support from the DJs and blogs that give your opinions validation, for fans of obscure releases that only you understand and know how to enjoy. A majority of the people on this app sound like real life incarnations of King of the Hill character Boomhauer, and I would not be too surprised if that assessment was mostly accurate. There are paid features for this app, totaling an absurd $10, you can identify people who were absent minded enough to make this mistake through their green pins identifying them on the map. You know that feeling when you pass by something on television like Jerry Springer, and its portrayal of humanity is so obtuse you can’t help but immerse yourself? Combine that emotion with one of the most poorly designed iOS interfaces and internet app concepts and you have CB. I have spent a few days on this app, mostly lurking and the most shocking aspect of it has to be that it is apparently inhabited by the same 4 or 5 people continuously, which the occasional preteen troll showing up to flaunt their new-found discovery of vulgar language. Burial employs Burial-style samples of early Burial releases, maybe I’m being trolled but it is still an enjoyable pair of tracks. Burial – Truant / Rough Sleeper is available from Hyperdub for digital download and a 180-gm 12″ vinyl on Juno. A well-played shift in focus from bass music stalwart Indigo for his latest release for Hypercolour imprint Hypercolour Limited. Moving away from the deeper dubstep sounds Indigo is probably most noted for, Indigo shows his versatility on three strong techno-minded productions. All killer, no filler on three tracks, none clocking in under the six minute mark. The EP opens with the releases eponymous Wake, utilizing the same sharp percussion that is a trademark of Indigo‘s garage influenced dubstep productions. Aradia plunges the listener deep, opting for stripped-down, minimally influenced style yet still maintaining a driving beat preventing any semblance of being mistaken for sleepily evolving dub tool. The EP closes with Kali, replete with the requisite filtered white-noise over a driving techno rhythm. Always having been a fan of Indigo, and a growing fan of stripped down techno sounds as I grow older, I feel privileged to be able to give this a quality listen – and encourage you to do the same with the previews below. Be sure to pick up Wake EP on its release July 2. Atlanta producer Anthony Rotella expounds on his freshly-minted Edgewoode moniker. Following up his spring release for Los Angeles’ based Deceast, Edgewoode returns with two more originals and a remix from Embassy alumni Clicks & Whistles for a decidedly Southern release. The release’s A-Side Damn! is a peak-hour track combining biting synth and organ interplay over a shuffling drum beat, a nod to the musical landscapes of Edgewoode and Embassy’s Atlanta roots. The flip-side features Freak!, employing a sparse, expressive arrangement that creates a soulful vibe reminiscent of classic g-funk era rap buoyed by an instantly recognizable vocal. Rounding out the release is a rework of Freak! by Charlotte duo Clicks & Whistles, who ratchet the original up in their signature style.